Python for SPSS - How Does It Work? SPSS with Python III – How Does It Work? You are here: Home SPSS Python Basics SPSS Python Introduction SPSS with Python III – How Does It Work? finally, Python can use this information to modify our data, output or syntax either directly or by creating and running SPSS syntax. Right. So SPSS syntax may hold some Python code and it needs to be enclosed by the BEGIN PROGRAM. and END PROGRAM. commands. Whatever lines are between those are passed on to Python. The entire specification is known as a Python program block. However, the way this code operates differs between Python programmability and scripting. So let's take a closer look. Each window, in turn, may hold several other objects. For instance, the Data Editor holds variables and cases which -in turn- hold data values. Like so, the entire program is organized according to a tree structure known as the object hierarchy. SPSS Python scripting uses the SpssClient module to access and navigate through this object hierarchy. While doing so, it can look up and modify information on different objects. Although Python scripting is highly challenging compared to Python programmability, we'll include a short example anyway. Perhaps ignore the actual code and just look at the Python-comments because these illustrate how we walk through the contents of an output window. *Look up all table titles with SPSS Python Scripting. Note: this syntax will only print some table titles if you actually have some tables in the active output window. Python programmability -way easier than Python scripting- does not use the SpssClient module or the SPSS object hierarchy. Instead, it retrieves data properties directly and often -not always- modifies them by creating and running SPSS syntax. A simple example is shown below. 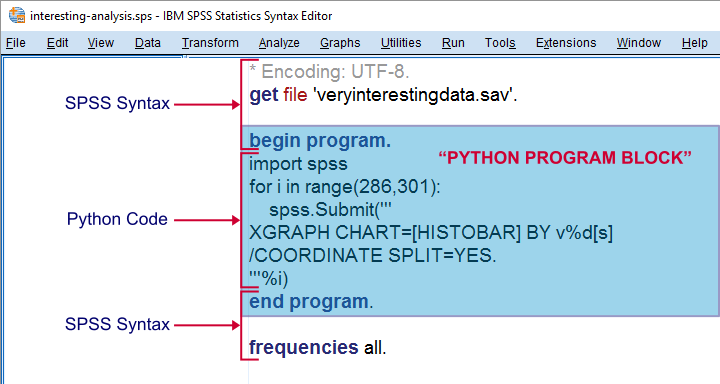 In this example, SPSS passes syntax to Python. Python looks up each variable name and then creates and runs an SPSS RENAME VARIABLES command. So here we have SPSS syntax holding Python code that -in turn- holds SPSS syntax. Whether to use Python programmability or scripting depends on what you want to accomplish. If it can be done by SPSS syntax -mostly editing data or running procedures- then creating and running this syntax with Python programmability is usually the easiest way to go. It doesn't really matter if the required syntax is complex or huge: Python will handle it for us. Like so, our SPSS Clone Variables Tool uses Python programmability. However, SPSS syntax can't modify tables and charts in your output window. Well, ok, except for OUTPUT MODIFY introduced in SPSS version 22. Since programmability can't edit output items either, Python scripting is the way to go here. Like so, our SPSS - Set Chart Sizes Tool uses Python scripting. I guess that's about it. Although Python for SPSS tends to be rather technical, I hope this tutorial gave you at least some idea of how it works. For a more thorough understanding of Python for SPSS: just do it. Next tutorial: SPSS with Python IV – How to Use It? Hi Mario, yes you're totally right. I should adjust the width of the syntax block as well with some .css but I won't have the time until after my holidays.